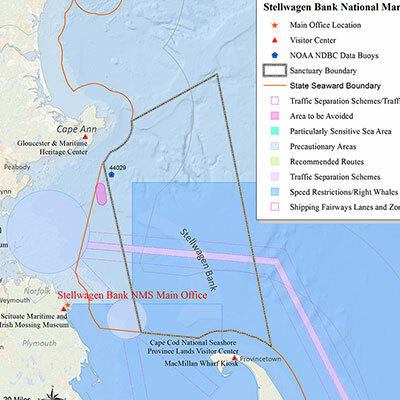 The Stellwagen Bank National Marine Sanctuary, between Cape Ann and Cape Cod in Massachusetts Bay, encompasses a total of 638 square nautical miles, or 842 square miles. The sanctuary also includes all of Tillies Bank (situated to the northeast of Stellwagen Bank) and southern portions of Jeffreys Ledge (situated to the north). Whale strike and entanglement research at SBNMS uses acoustic recording tags (DTAGs) and newly designed data visualization software to analyze the underwater behavior of whales. The results allow virtual visualization of the underwater activities of a tagged animal, concurrent with the sounds the animal makes and is exposed to shipping tracks or other components of the underwater soundscape. 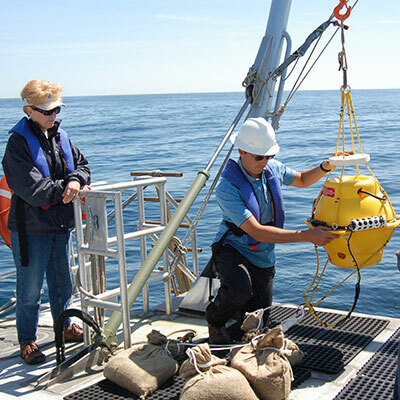 The project brings together researchers from NOAA, universities, and other organizations. The numerous sources of underwater noise and their potential impacts on marine animals are topics of substantial interest and concern among scientists and the public. Potential impacts to marine animals exposed to continuous sources, such as commercial shipping, have recently begun to garner more attention. Assessments of background underwater noise levels within the SBNMS in 1996. Atlantic cod (Gadus morhua), in the Gulf of Maine have been exploited commercially for several hundred years, and continue to be heavily exploited today. 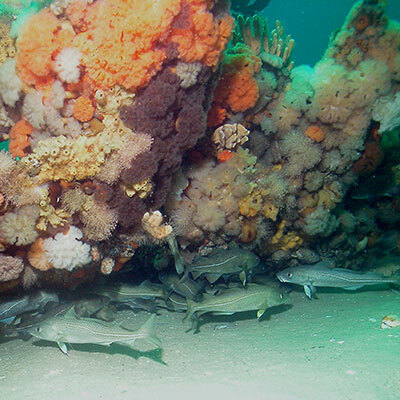 A project between the SBNMS and several partners used acoustic telemetry technology to quantify cod movement over different features of the landscape to inform management of the SBNMS and the greater Gulf of Maine region. The southwest corner of the Western Gulf of Maine Closed Area overlaps with a portion of the Sanctuary and presents the opportunity to study seafloor habitat recovery following anthropogenic disturbance by bottom-contact mobile fishing gear (such as trawls and dredges). The Massachusetts Water Resources Authority’s Harbor and Outfall Monitoring program supports water quality monitoring with the sanctuary. The sanctuary sits astride the historic shipping routes and fishing grounds for numerous ports in New England that have been used for hundreds of years and are evidenced by the remains of historic shipwrecks on the seafloor. Interested graduate students and principal investigators should contact the Research Coordinator to discuss their research ideas prior to launching a project. Research activities may require a permit from the sanctuary.